Recently I finished reading the book Wild by Cheryl Strayed. She decides at age 26 to work hard as a waitress to buy the items needed for the hike, sell all her belongings and then finally, to walk 1000 miles of the Pacific Crest Trail on her own. She had a most excellent adventure and discovered a lot about her strength, courage and tenacity. But what I think is most important, she had the courage to get lost. I’ve written about my wanderlust before. Unlike Strayed, I don’t want to roam or travel because I’m broken or lost, I want to find out what I’m made of, to face new challenges and create new experiences. I want to explore! There is such a big world around us with so much to see and do that being in one place too long feels like I’m a mouse stuck on glue paper. As I switch to running mostly trail races and eventually ultras, beginning with my first 50k some time next fall, I often find myself thinking how much this will kill my speed on the road. We’re all preoccupied with pace, right? Then I remember it is possible to be fast on trails. And then I think about how I feel when I’m pushing myself to go faster for longer periods of time. Sure, it’s hard and takes a lot of out of you, but ultimately it isn’t the speed that gets you, it’s running 26.2/31.1/50/100 miles which makes or breaks you. Those 50+ mile runs are all about forcing yourself to run when you don’t think you can go any further, it has nothing to do with how fast or how slow it’s done. They are about pushing your Self way past what you think you are capable of doing. That is what I want to feel, a sense of conquering myself, the inside voice that tells me there’s no way I can run 50 or 100 miles. Vanessa Runs speaks my language: she runs 100 milers because it’s the only thing that demands her all. Boredom doesn’t exist on trail runs, every route has something magical to see, something new to uncover about myself. Nature is a beautiful place, the scenery is never dull. Zoe Romano, the woman who ran the Tour de France, also knows what I’m talking about. She ran the route simply because she could. That is what I want for myself, to push my mind and body beyond any reasonable limit or expectation. I want to see how far I can make myself go before I can’t go any further. In 2015, I will be spending a lot of time running alone, various trail races and trail relays solo, no one running with me or waiting for me in the middle or at the end. I need to do this for myself, to see how far I can go just for me and no one else. There is a lot of truth in that small thought. And it got me thinking. Most of my running is done on my own and I like it that way. I can tell when I’ve been running with people too much because I feel the tug of the solo run; my inside self telling me it’s time to run on my own for a while. Running has given me great confidence to wander the city on my own, finding new places and seeing new things I’d never see in a car. I now know, regardless of where I am, I can find my way back to the start. It might take me a bit longer than planned, but I’ll get there. When I run by myself: I can go anywhere I want. See anything I want. Stop and rest if needed. Take a lot of pictures. Explore new territory. I love running with my friends, but trail running is something totally different. I crave the alonetime in the woods, running through mud and dodging downed trees, jumping over rocks and crashing through steams. On the one hand, I love showing others around the trails especially since figuring out how to get 14-16mi out of them without passing anything twice. On the other hand, being alone in the woods is glorious and magical and soul-filling. Superman gets his energy from the sun, I get mine from getting lost in the woods. 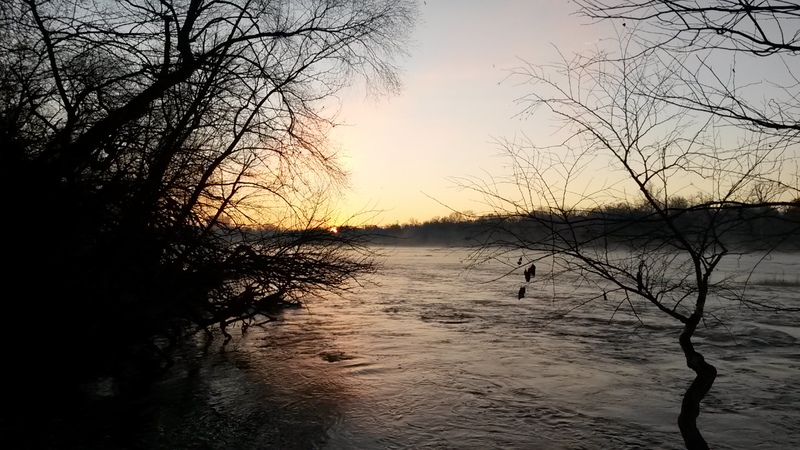 Watching the sun rise over the river, smelling the wet leaves, the soft dirt under your feet, listening to the river as it tumbles onward. It’s difficult to chat with anyone on the trails anyway. You have to watch where your feet are going, concentrate on avoiding roots, rocks, ruts. Listening to music while running on trails is contradictory. 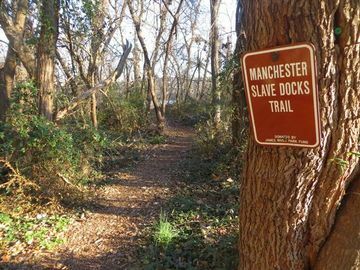 Fear keeps me hesitant in wandering and exploring new trails, then I remind myself how foreign Buttermilk, Forest Hill, North Bank, Belle Isle, the flood wall and the slave trail felt to me when I first started. Now both me and my dog have every step memorized. It is this realization that gives me the courage to try out the new places on my own because, eventually, I will every one of those steps memorized, too. 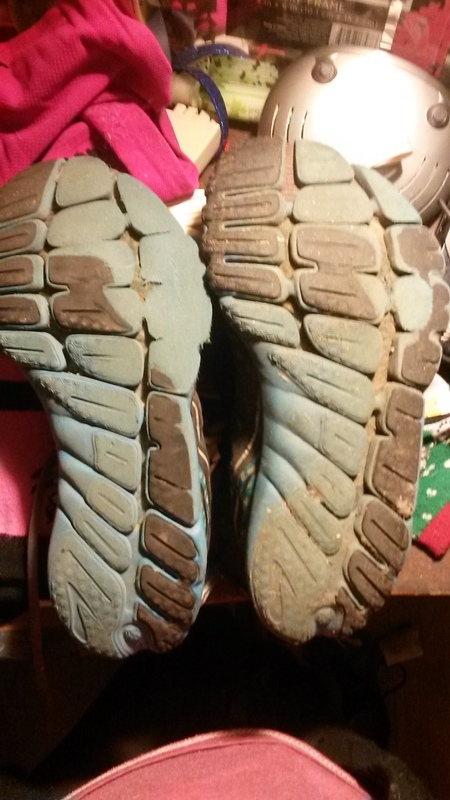 These are left foot of the very same shoe (Brooks PureDrift); the one on the left has close to 1,000 miles, the one on the right close to 500 miles. Notice the wear pattern suggesting I pronate a bit too much to the outside edge of my left foot, called supinate. I’ve been trying to work on this during my base-building phase of recovery and it’s not easy. These are the right foot, the match to the left in the top picture. The one on the left also has close to 1,000 miles, the one on the right has close to 500 miles. Notice how less severe the wear pattern is on my right foot versus my left foot. Interesting isn’t it? I think so. Yet, when I am running on the trails, I’m far more even footed and land square on my forefoot and less on my toes. My guess is because our trails here are quite technical so I’m forced to be more careful of my footing then when I’m on the road, when I can easily zone out. The issue is the almost severe supination in my left foot is causing all sorts of problems in my left foot and ankle. Before I was laid up with the stress fracture, I swear every tendon in that foot was plagued with the -itis. My foot and ankle simply hurt all the time and it wasn’t going away. 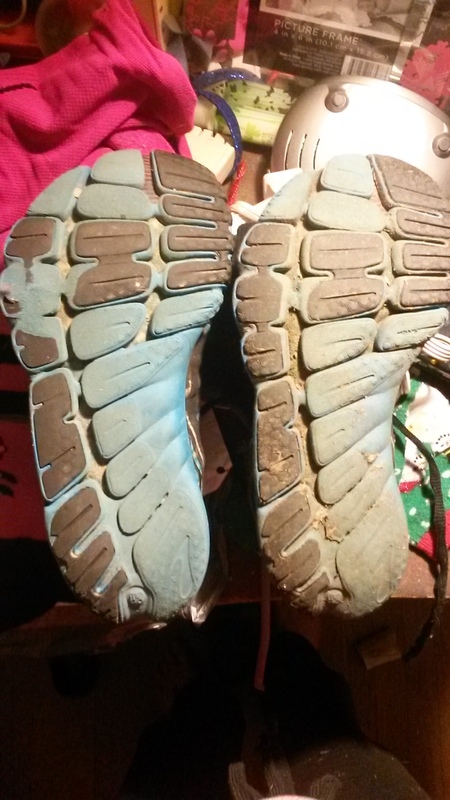 Finally I decided to flip over my shoes to check the wear pattern, a lot easier done with minimals because all there is to the shoe is the tread and one needs to keep an eye on it in order to replace them when the tread starts disappearing, like above. And so back to present. I’m really trying hard to fix my form but it’s so hard. It’s requiring me to concentrate on each moment the foot hits the pavement and make sure I’m landing on the foot where I feel it’s strongest. And that feels very weird and just plain wrong. But after a month, it’s getting less hard. I still have to think about each footfall and check-in with my body to make sure the foot feels okay. I’m discovering it’s hard to run with my friends because when we are chatty, I stop paying attention to how my foot is landing. The process is frustrating yet absolutely necessary. I’ll get it right eventually, the change will happen and soon enough I’ll forget I even ran so goofy-footed. For now though, it’s frustrating. For the last month, I’ve been participating in a journaling project with five other women for a total of six. We are part of a larger group, but have been lumped together with other strangers to help the assignments be less daunting and so our voices do not get lost in the void. As part of the assignment on self-love, we were tasked with writing ourselves a love letter. In contemplating mine, I thought it was silly as I tell myself a few things almost everyday, a mantra if you will. So really, writing a love letter to myself was unnecessary, right? Until I actually decided to put pen to paper and then read what flowed through my fingers. You’re changing, love. Change isn’t a bad thing. I know you sometimes miss the old you, the one who shoved everything deep into your core and squared your shoulders against the world. Things were easier to deal with when you didn’t let it touch the most intricate and vulnerable parts of you. Things didn’t hurt so much when you were already armored and actively carrying around your shield. But love, that also really sucked. You were exhausted from carrying it all around on your own. The shield was starting to get real heavy, right? And you almost never cried. Keeping everything locked away only served to keep you in a place where criticism and biting sarcasm was the norm. It kept you from really seeing yourself and others. It kept you from being your best self. You’ve done good, kid. (My dad told me this all the time.) It didn’t work out with Chris, but there’s absolutely nothing you can do about that either. He’s just not ready and you’ve been in that exact place before so you understand what it feels like. Truth is, you want to really wander and he keeps you bound to this place. You would have allowed him to be an excuse. Love happens and it’s always good. It reminds us we’re human and there is always love. So be easy on yourself. Let it all flow. Love him as a dear friend because you two are good at that, it’s the truth. And love yourself. Always. You are enough. Always. You are strong. Always. Now stop being afraid and go wander! Another of my journaling sisters spoke this morning of choosing a word or words to begin each new year. For her first, she chose ‘deliberate’ and ‘intention’. She laughed when thinking back, saying she worked hard all year to even remember the words she had chosen and in retrospect realizes maybe ‘consideration’ is what she was aiming for instead. I didn’t have to stretch too far to realize this idea of shedding the old me to become the new me also included my way of running and where I explore or wander. I have to say ‘see you later’ to a lot of running friends as I leave them for the trails. They’ll be running road marathons, half marathons and the like while I focus solely on trail races with a 50k as my fall 2015 race. I’ll sprinkle in a few road races here and there for fun, but trails are where my soul can be found. There are a small contingent of trail runners here and an even smaller group who run ultras, so I will be forced into a new world almost entirely on my own, almost as if starting over. I will make new friends, I will have to speak to people I don’t know about more than just the weather and it will be a fear worth conquering because this is what my heart and soul want more than I can ever express in words. So for 2015, I have decided my word is ’embrace’. It’s hard to talk about running when you aren’t actually doing any running. One can only talk about the adventures of aqua jogging but so much before it becomes rather boring. That is all over now! After two solid months of no running, I was able to start up again exactly one month ago. Things went slow, only three miles for the first week to test the foot, to make sure it was really healed and ready for the pounding on pavement. The first handful of runs were worrisome as a stress fracture heals by being used in moderation; I could feel the hurt in the foot but in a good way. I took it easy on those runs, doing them every two days to be sure there was enough time for healing in between. Every day since I have been able to feel the foot getting stronger and stronger. 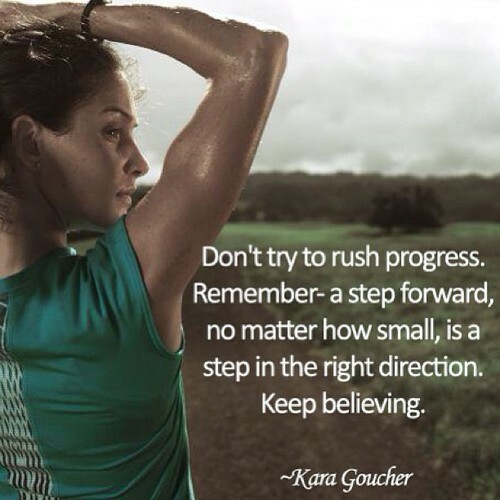 Progress of any kind is slow, dependent on time and repetition and consistency. I have been given the chance to reflect and soak in the interesting parallels between recovering from an emotional break and a physical break. Both invoke a chance to recover, realize I am tough, to find myself and rediscover the reasons I like being me and how running is now such an integral part of my life. Sometimes I become frustrated by the creeping forward motion and grump about wanting to run longer miles or for the pain to be washed away; my body craves the distance and losing myself in the woods, my normal. Then I remind myself that in one month I have already been able to run up to five miles – in fact, today I ran seven, two of them on trails. The creeping may be both discouraging and agonizing, but it will help me become stronger so I can run for many more years and not just right now. Heartbreak is similar. It teaches us about suffering and the real courage is deciding to show up anyway. We need to fight through the muck to get to what is on the other side which is often greater understanding of oneself, determination and adversity, a durable sense of self. Tenacity because you know you have been at what you perceived as the worst point in your life and yet you have survived to run another day and next time you will not be as frustrated or feel downtrodden. We learn our worth through moments of emotional unrest. My dad has always taught me and my sister to stand up for ourselves, to fight for whatever we want because no one is going to drop it in our laps. A long time ago my mom told me the easiest thing you can ever do is to give up, to say, “I can’t”. Both parents taught us that when you dig in your heels, show up and really do the work, you begin to see progress happens through commitment and continued practice. You realize giving up will not be an option. You won’t even invite it to the party. Courage will help you remember there is always good that exists on the other side of pain, light on the other side of struggle. So for now, I’m taking it easy and reveling in how far I’ve come while also looking forward to how far I still have yet to go. I’m still alive, I still woke up this morning, I still have my kid and three dogs. I still have my house with its big backyard. I still have my car, though it needs repairing. And most important, I still have my legs and feet to can carry me far.